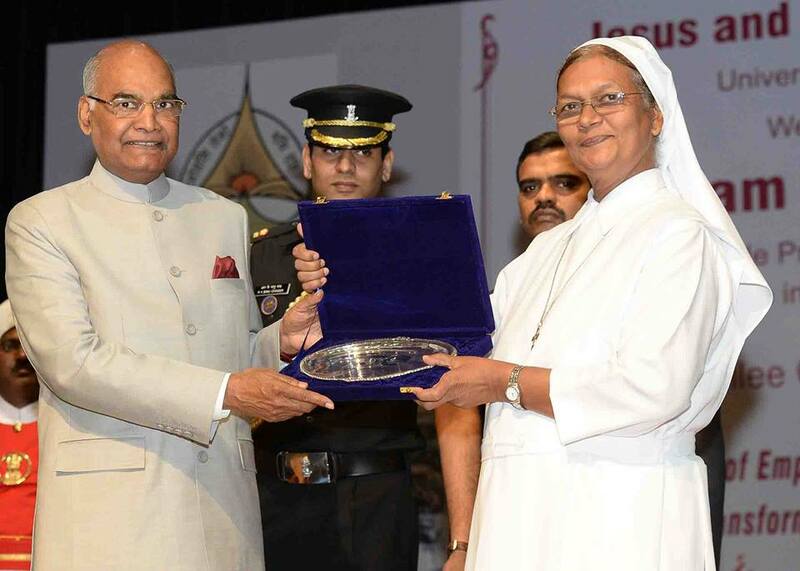 New Delhi: The President of India, Shri Ram Nath Kovind addressed the inaugural function of the golden jubilee celebrations of Jesus & Mary College in New Delhi today (September 20, 2017). Speaking on the occasion, the President said inaugurating the golden jubilee celebrations of Jesus and Mary College was a matter of honour for him. This institution has contributed enormously to the cause of education in New Delhi and in our country. For five decades, it has taught and prepared young women to break glass ceilings, to achieve their potential, contribute to society and to the economy, and become part of the process of nation building. The President said that the Christian community – whose history in India goes back 2,000 years and which has contributed so much to our shared culture – has carved a special role for itself in education. Missionary institutions such as this one have become symbols of scholarship, dedicated teaching and academic excellence. This is so appropriate. For all religions in their essence urge us to constantly learn and evolve and grow, to acquire knowledge and gain wisdom. And so become better human beings. The President said that the goal of education is not just to acquire knowledge. That is only a starting point. It is much more critical to use the knowledge one gets from education to enhance the welfare of the less-privileged among us. The truly educated are not those who collect degrees, but those who use those degrees and the underlying scholarship to become nation builders in our society. Jesus and Mary College is a role model for others. It is a matter of great happiness that the college has chosen its golden jubilee to partner with a nearby NDMC school and facilitate the development of the school and its children. This is a praiseworthy example of giving back to society. It can be adopted by other colleges too. The President said that India is in the midst of multiple transformations. We are an old civilisation but a young people. In the first half of the 21st century, we will have the largest young population in any country of the world. It is crucial to harness the energy of our young people and use it to make our country a developed society. Education is fundamental to this effort – calling for both access to education and quality of education. The President said that the nature of our economy and the very concept of a workplace is also changing. The Fourth Industrial Revolution and the advances in digitisation and robotics will together make certain types of jobs obsolete and also create many new opportunities. How our society copes with these dramatic changes will be dependent on how our leading institutions of higher learning – institutions such as Jesus and Mary College – will respond. We need to upgrade our higher educational system and, to the extent possible, make it future proof. Our education infrastructure, curricula and modes of teaching have to become 21st century compatible and be nimble and dynamic enough to constantly embrace change.